Check the links below, that clarify what is the actual story behind the fake and misleading viral video. According to news published by Radio Pakistan on 3rd March 2019, funeral prayer of Havildar Abdur Rab Shaheed and Naik Khurram Shaheed was offered at their native town in Dera Ghazi Khan on Sunday. According to ISPR, the shaheed were buried with full military honour for their supreme sacrifice for defending the motherland at Nakyal Sector. In the above video at 1:08 you can see the Pakistani officer is holding the same child as in the viral video at 0:12 that claims the shifting of IAF Balakot victims from Balakot to Khyber Pakhtunkhwa and Pakistani Military officer admits to martyrdom of 200 militants during Indian strike on Balakot. So now this is very clear that the video is not related to shifting of bodies of IAF strike Victims from Balakot to Khyber Pakhtunkhwa or Pakistani officer admitting to martyrdom of 200 militants. If you carefully watch the two videos, you can see that there are many similarities. The claim to the real video is being changed to fool people. Below is an image that you can see in both the videos for few seconds. In the video the person says “kal 200 banda upper gaye tha iska naseeb mein likha huaa tha shadat, humare naseeb mein nahi likha hua tha, hum log jyada chadhte hain, jaatae hain attae hain”. That means he is talking about death of an individual who went up the hill with 200 others and never returned alive. There is no mention of Balakot victims at all. Check the weather in Balakot on 3rd March 2019.There was no snow that day. In the image below you can see the snow behind. We share with you the tweet by Mr F.Jaffery who has shown enough evidences to prove that the claim to viral video is fake. 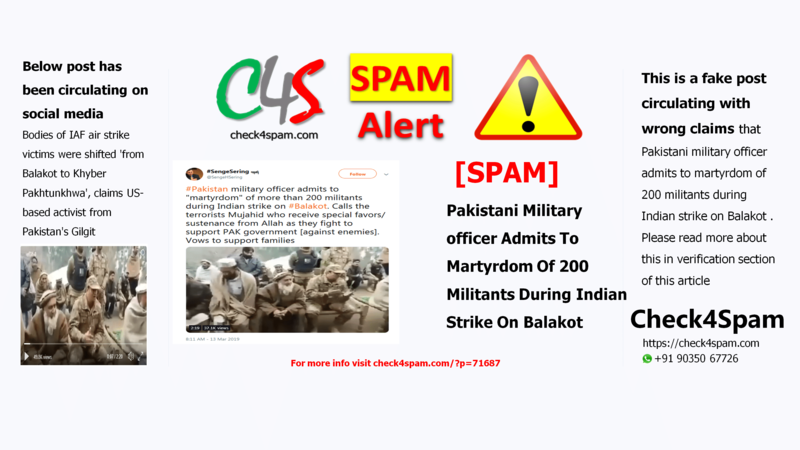 A lot of people have sent me this video ( https://t.co/7SiqwN6ftf ) which was uploaded to YouTube by @Defence_360 with the claim that this video is related to Balakot incident. Initially, the video looks doctored. Audio isn't in sync with video.